Four Blog Blitz and a Giveaway!!! There is much for me to catch up on here at the blog. There are posts I’ve been wanting to get to in the last couple of months that I just haven’t been motivated enough or had time enough to do. And I think I’m not alone. I sense a real slowing down in the book blogosphere these days. At least with the blogs I typically read. Back to school must have thrown a lot of us for a loop. But now fall is here and life is getting somewhat back to normal. So I’m gonna condense my thoughts and toss them all out here in one post. Ok? Ok.
1. Back in June, my husband and I celebrated our 25th anniversary. We took a road trip to New Orleans but on the way we took a small detour to Monroeville, Alabama. This was the week of the release of Go Set a Watchman. You can read all about that part of our trip here. But I never did fill you guys in on the New Orleans part of the trip. We had a bit of a rocky start because we were signed up to take a walking food tour right when we pulled into the city. My contact for the tour was actually communicating with us from Chicago and he gave us the wrong starting point. So we waited for our group to show up for the one o’clock tour and we waited and waited. Finally, I called our guy back and he realized he gave us the wrong location and proceeded to direct us BY PHONE ON FOOT through the streets of the French Quarter to help us find and catch up with the rest of our group. (Did I mention it was 800 degrees?) When we finally caught up we saw that the group had WAITED for us. Ugh! We felt terrible!! But they were forgiving and we moved on. Our guide was really great and the tour really did help us get acclimated to the area. It was smooth sailing from there. While Mike attended Tax classes, (blech), I attended a cooking class. SO FUN! I highly recommend that if you are ever in the city. We saw a lot and learned a lot and I had a fantastic view from my hotel room. We had the French Quarter to the left, Harrah’s Casino in front of us and the Mississippi River to the right. We would have liked to have gone to the WWII Museum but we couldn’t swing the time. Overall we had a great trip. 2. While in NOLA, my Blog Birthday happened. Yay! Two years of blogging! It came at a crazy time so I put it on the back burner. Now that I can think about it, here is what I’d like to do. Since it is my TWO year celebration, I’d like to offer a giveaway of a book that I have TWO of. I try to stay on top of my books and purge frequently so that means, I don’t typically have duplicates. But I do have duplicates of TWO that I’d like to offer. The first one is a beautiful, hardcover edition of NOAH, a wordless picture book by Mark Ludy. I was happy to be part of Mark’s Kickstarter campaign a couple of years ago and I was awarded with several copies of his book. I’ve got one left and it can be yours if you are the winner. The second book I have two of is The Elegance of the Hedgehog by Muriel Barbery. If you are not familiar with this novel I must tell you it is a bit on the philosophical side. Parts of it just made me say, “Why do people think like this?? ?” But I will say that parts of it are completely delightful and one of my favorite lines/scenes in all of literature is in there so I consider it worth the read, for sure. Whichever one of these two books you would like, you can just mention it in the comments. If neither appeal to you, I have another offer down the page, stay tuned. Well, I didn’t hate it. It’s no Mockingbird but I didn’t hate it. And I didn’t hate Atticus either. It’s true his flaws were exposed, but I found his personality to be the same. His endearing devotion to Scout and his commitment to work and his love for his community were all the same. I feel like Atticus was taking the situation at hand and doing the best that he could to maintain peace in his environment while other parts of the south were exploding in unrest and violence and rightful revolution. The world was a changing and that’s never an easy thing, even if it is the right thing. I loved Scout and I could see the direct correlation between her as a child and her as an adult. But she did eventually frustrate me when she was in the thick of this conflict and she just wouldn’t go and talk to her dad. So, the one that she loved, trusted, and adored disappointed her and she had to find out, (very late in life I might add), that dad was not perfect. Did she really miss all that in her coming of age years? Her interaction, or lack thereof, with Atticus bothered me more than Atticus’ actions. Don’t get me wrong, I hurt for her and sympathized with her but she could have saved herself some of her heartache and a slap across the face if she had just gone to him. And when Uncle Jack told her SHE was a biggot as well, that got my attention. My final thoughts: When someone has really messed up or is seriously flawed, can they still be a good person? Can your view be wrong, really wrong, and there still be hope for you? Does the one bad thing you do or support mean there is not just as much, likely more, good in you? Can’t we look at the person and the life as a whole before characterizing their worth? 4. It was a year ago today that I celebrated the completion of my LOST Book Club reading goal by throwing my LOST Book Bash. It was a fabulous night with perfect weather, perfect company, great food, dancing, and lots of book talk. I gave away new copies of my Top Ten favorites and sent everyone home with a parting gift. 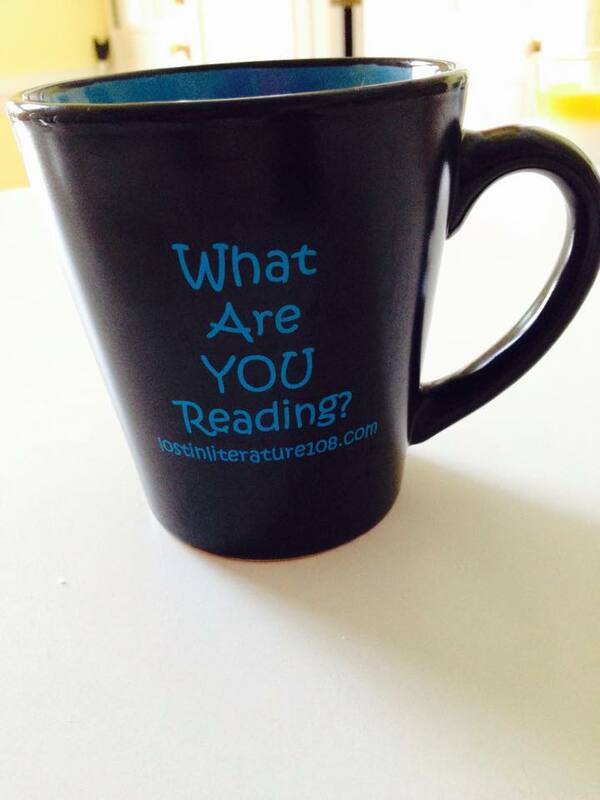 I had mugs made up with my blog address and the question: What are YOU Reading? And it turns out dear friends, that I have just a few of those parting gifts remaining. So, if you would like to have one of these little jewels, all you have to do is comment here on the blog to let me know. I will pick a random winner this Friday, OCT. 2 and I will get in touch with you to let you know. This giveaway also counts for the blog birthday giveaway if neither of the books I’m giving appeal to you. So, that’s two giveaways. One for the blog birthday and one for the Book Bash memory. Enter for whichever one you’d like, or both. Good luck!! Giveaways good only in the US. Sorry friends. Postage. I love that mug! It would save me having to ask everyone I meet that question! I’m glad you gave me some other thoughts to think about with Go Set a Watchman. I guess I wish I had become more into it (I was interested in its themes) but it didn’t sweep me up. ps. I read Hedgehog for my book club a couple years ago. Some parts I liked. Happy blogaversary! Those are awesome mugs! Rebekah started it tonight. What else can she do in all this crazy weather?